Just getting back from a whirl-wind tour of the MORE Project in Brazil. I have posted a new photo album in the margin for anyone interested. From the Amazon River and Acai berry harvesting, to a processing facility, to a jungle island school, to the many different initiatives comprising the MORE Project, to the favellas of Niteroi, this was an exhilarating and emotional trip. What MonaVie, Sergio Ponce, and the MORE Project are doing in Brazil is incredible. May God continue to bless their efforts to His glory! My co-author and friend Orrin Woodward and I feel strongly about being good stewards of God's gifts and giving to good causes. We strongly support a 501c3 organization called All Grace Outreach. You can read all about this organization at www.allgraceoutreach.com. I am told this site is slightly under construction, and expanded capabilities will be available there soon. All Grace Outreach specializes in donating to causes where people are underprivileged, such as orphan and/or abused children, battered spouses, homeless inner-city people, and to the organizations that support these people through a gospel message and outreach. All Grace also supports Christian publications and the development of Christian ministers for preaching both domestically and abroad. "First, we can be wise stewards when we understand that none of our possessions are our possessions. They belong to God, and we will all be called to account for how we used what He entrusted to us. The second consideration of good stewardship is that we should spend our loaned resources in light of God's priorities rather than ours. Our sacrifice honors Him and displays obedience to Jesus' command to store up our treasures in heaven rather than on earth." I have been asked a lot recently about the decision Orrin Woodward and I made to donate 100% of all author proceeds, royalties, etc. from the hard-cover version of Launching a Leadership Revolution to charity. Orrin and I both feel strongly about our faith in Jesus Christ, and want to do all we can to give Him the glory for the things he has done in our lives. We want to make sure everyone knows where the credit belongs! Also, we share a soft-spot in our heart for children's issues. All Grace Outreach has given money in these areas. They donate to the development of pastors who are spreading the word of the gospel of Jesus Christ both domestically and abroad, planning church plants, supplying pastors in areas of persecution, and supporting missions work. Also, they have donated to orphanages and homes of shelter, and to programs that give food and protection to inner city homeless across the country. Finally, Orrin Woodward and myself are affiliated with so many wonderful people all across North America, and for years we have had requests and suggestions about diferent ways to gather support and momentum for making a difference in our society. When the LLR book was picked up by Time Warner (Time Warner Books was since purchased by Hachette Book Group), it seemed like a great opportunity not only to give back, but to also involve other people in the vision. Every time a book sells, it generates money for the causes I just described. In that way, everyone is participating. If they like the book, and recommend it to someone else, they will not only be spreading leadership information but generating more for All Grace Outreach. 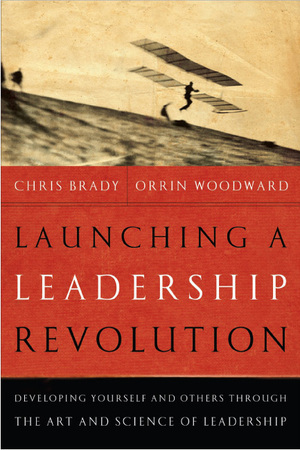 We have already (the book just came out October 22) received dozens of stories about how Launching a Leadership Revolution has made it into military bases, churches, schools, colleges, coaching staffs, and various leadership groups. We look forward to hearing more! If you have an interesting story to tell about the LLR, please post a comment on this blog so we can share it! (I intend to make the most interesting ones posts of their own, so they are not burried in the comment section). On behalf of Orrin Woodward and myself, we thank you for your support of the book! In addition to developing revenue for these causes, we sincerely hope that it helps in some way in your life, too!